Seeing is Believing This sample manual to teach Sales and Marketing is in MS Word format. Our Customizable Training Materials are your best option for developing the skills of your Sales and Marketing professionals. The courses included in this Bundle give you the ability to teach your students the most effective methods for establishing positive, customer relations. We've included nine, professionally designed courses in this Bundle for you to deliver Sales and Marketing instruction. You will be offering your students the ability to improve their interactions with customers. 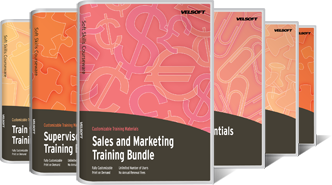 This Bundle brings together our essential courses for teaching Sales and Marketing. This courseware collection provides instructors with the most comprehensive resource available for teaching Sales and Marketing. Our Sales and Marketing Bundle is an excellent choice for instructors searching for quality and value. Our special Bundle pricing gives you more flexibility with your training budget. We understand your desire to create real opportunities for your students. We also understand that finding the financial resources for training can be difficult. Our training materials have been used by organizational instructors all over the world, and they have been exceptionally pleased with their purchase. We know your students are eager to develop their skills in order gain a competitive advantage in the marketplace. The courses included in the Sales and Marketing Bundle gives your students the vital information they need to demonstrate excellent customer service skills. Offering your employees and staff continued training will develop their inventory of possible sales and marketing techniques. As well, your instruction will lead them to discovering the ability to build solid client relationships. When you encourage your students to participate in continued training, you are developing opportunities for organizational success to happen. Our Customizable Training Materials haven been designed for potential Sales and Marketing professionals. You know their individual strengths, and you can edit the course content to focus more attention on weaker areas.